Wide-eyed and broke, I was pretty sure that New York City would swallow me whole. After too many meals of Top Ramen, I got a job working for a real estate office. Little did I know my boss was connected to the mafia. It wasn't until the day Uncle Tony (shoulda tipped me off, right?!) had a “meeting” in his office that broke out in a fist fight that I put the pieces together. Don’t judge, I was young and naïve. On special occasions, we scraped our money together to grab a slice. My favorite place was Sbarro. Even though I loved pepperoni pizza, I had recently gone vegetarian, so cheese with chili pepper flakes did the job. There was always a dish that called to me and one day, I finally splurged on what would become my very favorite—Ziti. Even though neither my boyfriend’s band nor our relationship endured, the memory of Ziti did. As soon as I learned to cook, I went vegan and vowed to create my own delicious version of the luscious cheesy dish that felt better in my body and made my compassionate heart happier too. To you, I offer my Cheesy Vegan Ziti with two possibilities for the ricotta cheese. Take your pick and enjoy! 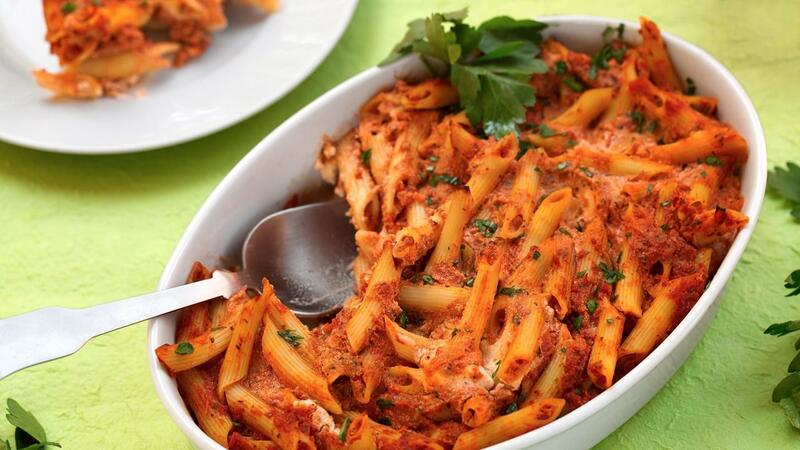 Baked Ziti is a dish similar to lasagna, but without the fuss of layering. With fluffy macadamia nut or tofu ricotta and creamy cashew cheese folded into pasta tossed with homemade marinara sauce, this succulent dish is as perfect for a cozy dinner by the fire as it is an elegant evening of entertaining. 1. Pasta: In a large pot, bring the water to a boil. Add pasta and cook until al dente. In a colander, drain pasta and rinse with cold water. Set aside. 2. Marinara Sauce: In a large saucepan over medium-high heat, add olive oil and onion, and sauté for 10 minutes, stirring frequently, until translucent. Add garlic, oregano, basil, and rosemary. Reduce heat to low. Add tomatoes and cover loosely. Simmer 30 minutes. Add salt and cook for another 15 minutes. Preheat oven to 350°F. Macadamia: In a food processor, purée macadamia nuts, water, lemon juice, olive oil, garlic, and salt for one minute. Scrape down sides and purée another minute, until light and fluffy. Transfer to a bowl and fold in parsley, basil, and olives. 5. Assemble: In a large bowl, toss ziti with marinara sauce and 2 tablespoons of fresh parsley (you may choose to reserve 1/4 to 1/3 of the sauce in case it's too much for you). Gently fold in ricotta so that there are a few teaspoon-sized chunks throughout. Swirl in cashew cream and pour into a deep 9 x 13-inch casserole dish. Bake for 30 minutes. Serve hot, garnished with fresh parsley. Swap vegan pesto instead of the red sauce, or add your favorite additions like mushrooms, olives, or artichoke hearts.